As an NHS doctor, I like Facts. Vote Remain. 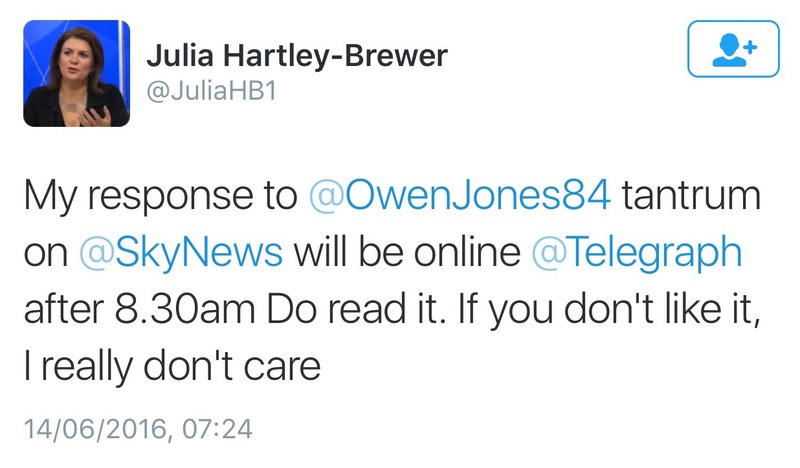 I got into a not quite Twitter war with Julia Hartley-Brewer recently, more of a Twitter scuffle, if you will. It was over the reporting and discussion of the events in Orlando over the weekend. In the worst shooting massacre in US history, Omar Mateen, a 29-year old US citizen, killed 49 LGBT people at a gay-club called Pulse, using an assault rifle he was legally licensed to own and operate. Mr Mateen was both very likely gay himself, and a Muslim man who phoned police prior to the assault and claimed the shooting in the name of Islamic State, the group based in Syria and Iraq. These are the tragic facts. The subsequent controversy was not over any of this, but over a review of newspapers on the night the news broke, between Owen Jones and Julia Hartley-Brewer on Sky News, in which Owen Jones left the live discussion in disgust at what he felt was the ‘downplaying’ of the homophobic motivation of the attack. 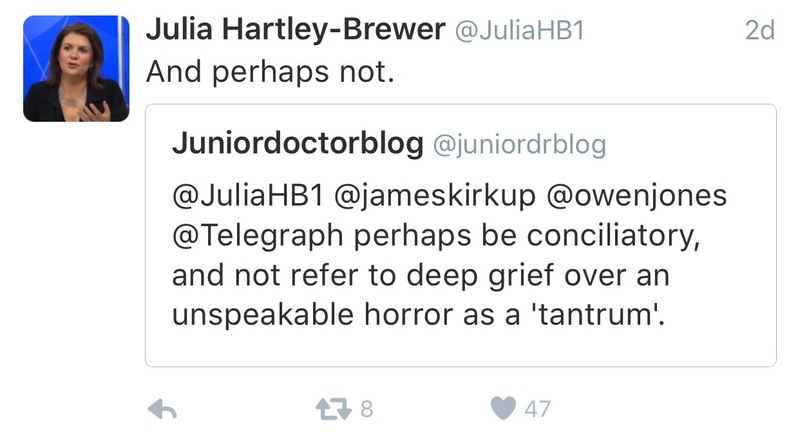 On Monday Julia Hartley-Brewer trailed a Telegraph article responding to this ‘tantrum’ as she termed it, on Twitter. In the initial few minutes, Owen Jones, raw from the news of what must’ve felt like a very personal tragedy, frames the events as ‘the worst attack in LGBT people since the Holocaust’. The presenter and Julia Hartley-Brewer attempt to focus on the fact that Mr Mateen was Muslim and draws parallels to the Bataclan attacks in Paris. Owen Jones takes issue with this, stating the most important part of this is it was a targeted attack on gay people. Then it all goes sideways. The presenter and Julia try to defend their position, with increasing volume, to say this was an attack from many angles, on human beings, on people ‘enjoying their freedoms’. I can see their point- this was, and it’s part of their job to make the news relatable to their audience- a predominantly white, conservative, straight demographic. I can also see the emotional element- both Julia and the presenter don’t want to seem as if they are downplaying the homophobic element, even though they perhaps without meaning to, just have. In their backtracking all sides get heated, and it gets worse. From the perspective of Owen Jones, he suggests this attack was chiefly homophobic in nature, and then is shouted down by two straight people. That’s his perspective and that’s how the Internet, rightly or wrongly, saw it too. Owen Jones is silenced. A few minutes later it seems a word in the ear of the presenter tries to salvage the situation by pointing out the Telegraph article does mention a viewpoint from Stonewall, the LGBT group. But this conciliatory bone backfires. I can understand his frustration, and it isn’t just with the two presenters. It’s with the medias obsessive fixation on framing all events into a single narrative. It’s with the predictable and sensationalist attempt to focus on this as an ‘Islamic’ terror attack. It’s with the lack of empathy the mainstream media shows to diverse groups, and how shoehorning this tragedy into a narrative that didn’t fit actually neglected the point- this was an act of hate against a specific community, and to downplay that fact is to ignore any meaningful lesson of tolerance from it. To downplay it in favour of another lesson of intolerance, towards Muslims, is a downright dishonour to the memory of those that died. To Julia’s credit she does state this was a homophobic attack, more and more after Owen leaves. And she makes the key point- the access to guns, especially assault rifles, is what made this tragedy so utterly awful, nearly farcical in how preventable it could’ve been. But it seems like both presenters are put on the defensive, so they have to shout back, and louder. Hence this deplorable and ridiculous Telegraph article, comparing Owen Jones to Islamic state. 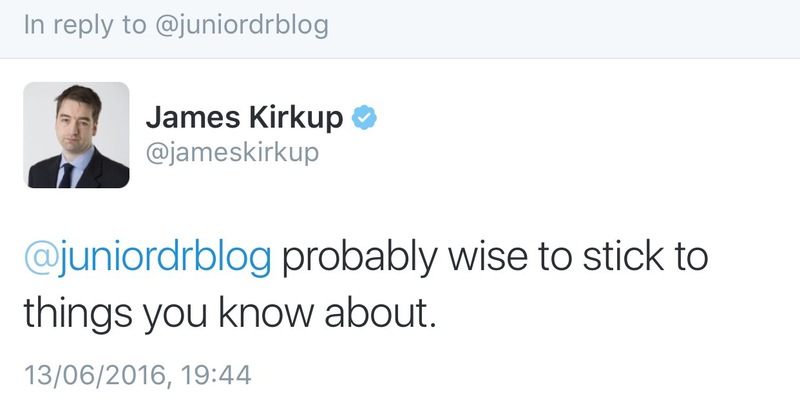 I suggested it might be meaningful to be conciliatory – but that 140 character message fell on deaf ears. If I’m perfectly honest I don’t think anyone in this situation acted particularly terribly. But it was a great example of what is fundamentally wrong with our society. 1. We as a collective don’t have a ‘knee-jerk’ reaction to intolerance of LGBT people like we do for racism, sexism or anti-semitism. That’s because ultimately mainstream society isn’t fully comfortable with the LGBT community. Tolerant, overall, perhaps. But not comfortable the way we are with race nowadays. It’s an ugly truth- but one that reared its head in this interview. 2. The fact this dissolved into a left wing vs right wing argument nearly instantly shows how divisive we have become as a society. I hate both words, they are simply different excuses for not listening to each other, and increasingly dangerous in the 21st century. Labelling every discussion as right wing or left wing renders the complexity meaningless. Medicine teaches you that nothing is simple, nothing is 100% true- this world view simply doesn’t apply to humans. No one is 100% right. We can only make decisions based on the best evidence available. But maybe I should just ‘stick to things I know about’.